All-in-one printer features a highly efficient MegaTank system that's equivalent to 30 conventional ink cartridge sets to let you print up to 6,000 black pages or 7,000 color pages. Clear, front-mounted reservoirs are sleekly integrated into the design so you can easily check your ink levels. With hybrid ink formulations, you can print deeper blacks and vibrant colors for more beautiful results. It also lets you connect your favorite mobile devices wirelessly or through the cloud so it's always ready to go, even when you're on-the-go. Fast print speeds up to 8.8 images per minute in black and 5 images per minute in color ensure you never have to wait long for your prints. 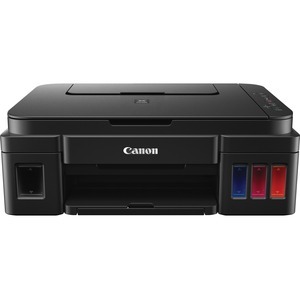 All-in-one printer also includes borderless printing, business card printing, 100-sheet rear paper tray, red-eye correction, image cropping and more. Envelope No. 10 - 4.13" x 9.50"